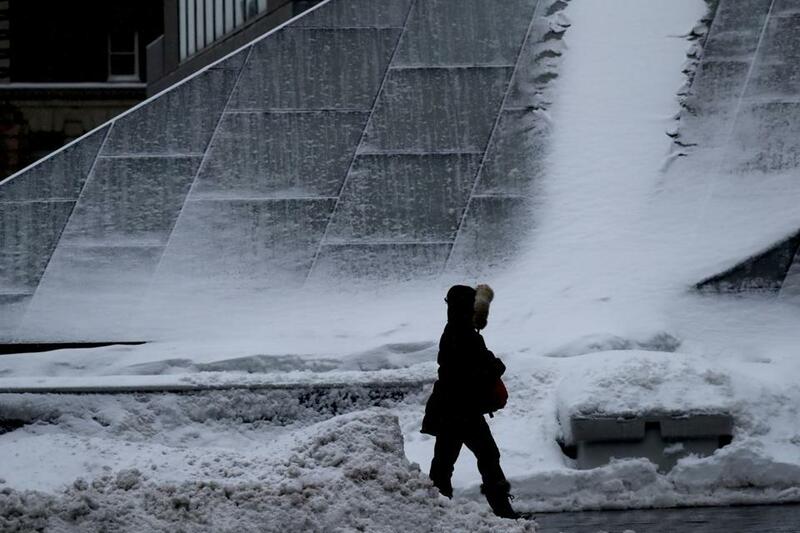 A person walks past a T station covered in snow on Summer Street on Monday morning. The MBTA is reporting delays on the Haverhill, Providence and Lowell commuter rail lines during Monday’s icy commute around 10 a.m.
An earlier problem on the Red Line, which created severe delays, has been resolved and regular service has resumed, the T reported around 9:45 a.m.
On the highways, slippery conditions were reported as overnight rainfall froze when temperatures dropped into the 30s. MassDOT deployed 2,910 pieces of snow removal and sanding equipment on state roads. Speeds on the Southeast Expressway and Interstate 93 north of Boston were near the speed limit around 10 a.m., according to Mass511.com. The Massachusetts Turnpike was also showing near-speed limit rides, according to Mass511.com.